Veronic Lewylillie is the Ypres Municipality North South Ambassador in charge of the Twinning (sister city relationship) with Wa in Northern Ghana. Veronic and her team will be taking Peace Poppy Balls to Wa Senior School, Ghana as part of the Peace Field Project twinning ceremony. 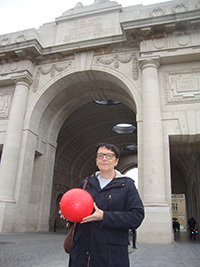 Veronic collected the footballs at Menin Gate, Ypres and she said, ‘These footballs will bring a lot of young people joy in play and in peace’. Veronic receiving the Peace Poppy Footballs at Menin Gate, Ypres. to deliver to Ghana.